Holiday is just round the corner! Have you baked gingerbread cookies? Did you decorated your house and/or your Christmas Tree? Do you feel Holiday Spirit? I am very interested in your Holiday traditions. If you join our challenge and create a project about Holiday spirit, please include a few words about your favourite Holiday/Christmas tradition – I will be happy to read it!! At this time of year, it was obvious that, when reading the theme’s challenge “Holiday Spirit”, I could only interprete it by “Christmas Spirit”. I choose a photo of my daughter, taken on Christmas Eve, but under the sun of Singapore. 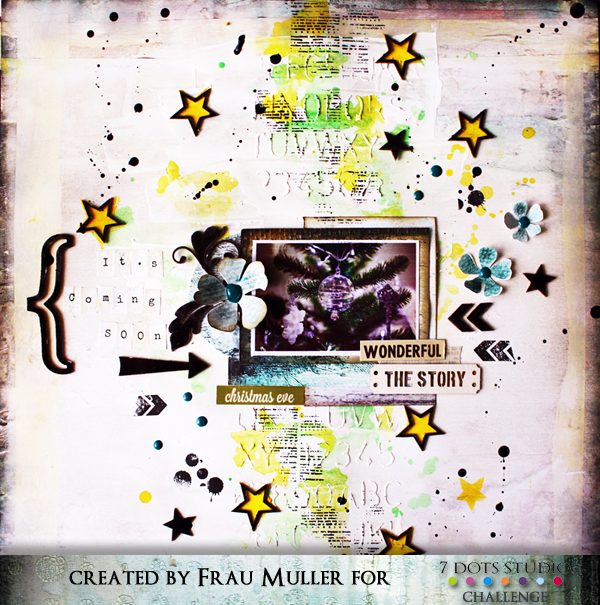 I’ve used the beautiful Destination Unknown collection. I whitened my colored paper roughly with some Gesso. After distressing the edges, I added some random stamping along the tear with grey ink. On the other paper, I applied some white Crackle Paste with a stencil. 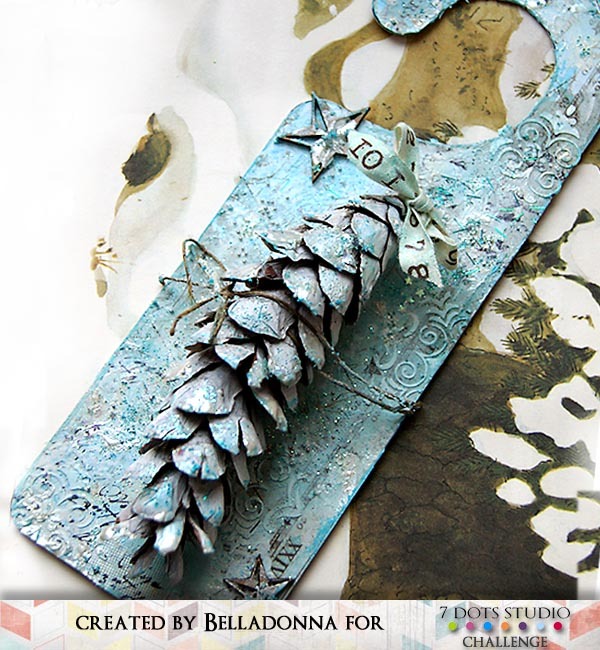 I chose some Twinkling in shades matching both papers to color the background. I added some gold glitters and I sprinkled also some White Art Sugar. 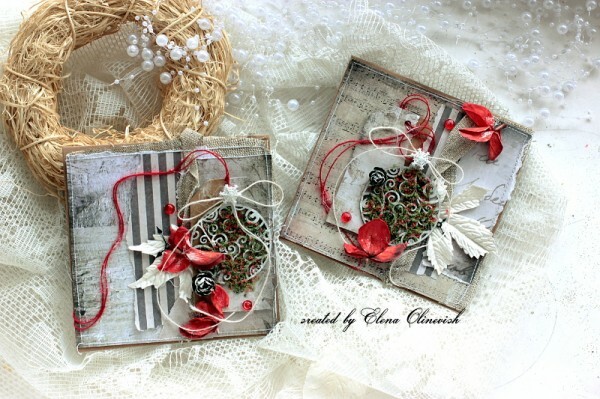 The snowflakes have been partiallly covered with “Aged Taupe'” embossing powder. I absolutely love the holidays and can’t wait to start celebrating.I always enjoy the most wonderful time of the year. 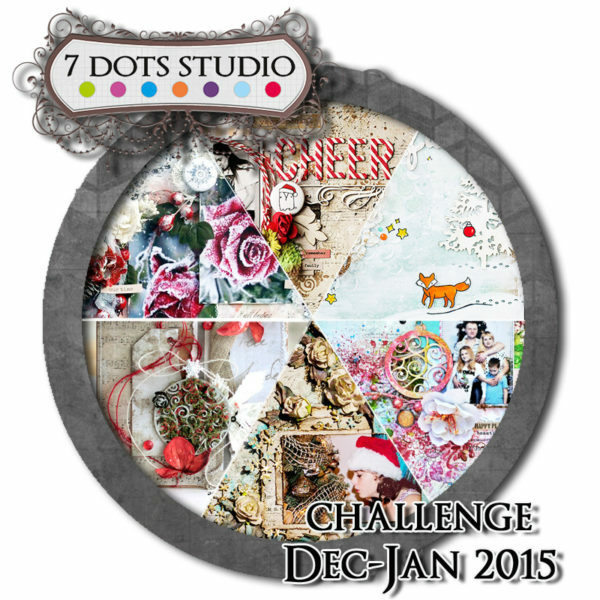 I used 7 Dots Studio newest collections: Destination Unknown, Thoughts Keeper and Soulmates to create this christmas layout. 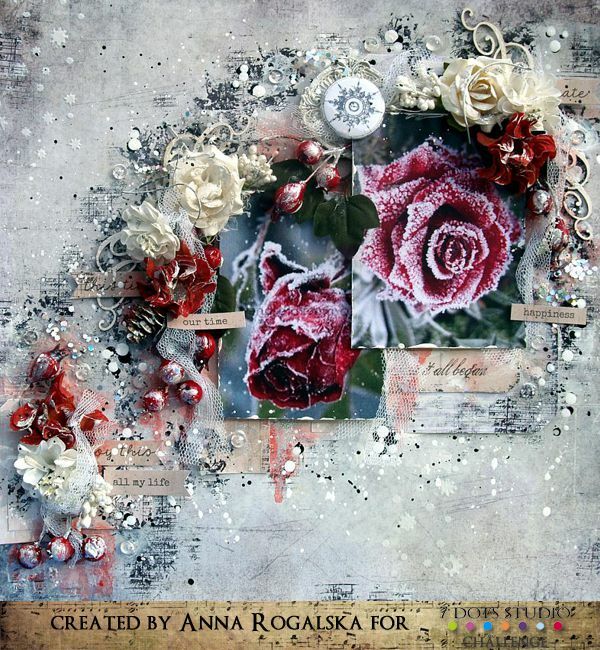 I embellished the layout with lots of red and white flowers to add to the holiday cheer. 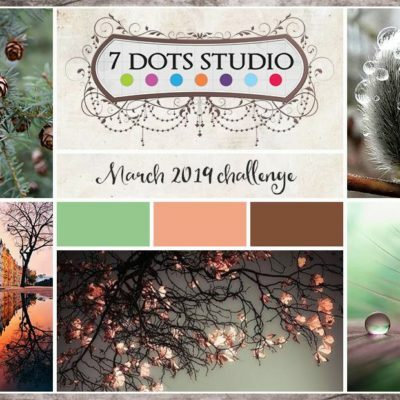 I have made 2 cards for Dec challenge inspired by the traditional color pallette and combined 2 collections – Nature Walk and Cold Country. Holidays are a moment to gather the whole family and spend wonderful time together! I Love Christmas and winter holidays- it is always such a fun to spend time with your family and enjoy the precious moments. I do really believe that on Christmas a miracle can happen and all dreams come true. Keep calm it’s coming!!! Do you feel this??? Everybody begin to prepare for the holiday, buy Christmas-tree decorations and gifts for friend!!! It’s amazing to see this miracle and waiting for magic. When thinking about “Holiday Spirit” I really was thinking about my family – Christmas to me is a family holiday. We usually visit our relatives during Christmas time and spend time together even more than during “normal” weeks. To me spirit of Christmas is about being together, pausing from the everyday life, it’s about having that loving warm feeling inside. There is colder and colder and the frozen ground with the chilling air announce that winter is nigh. 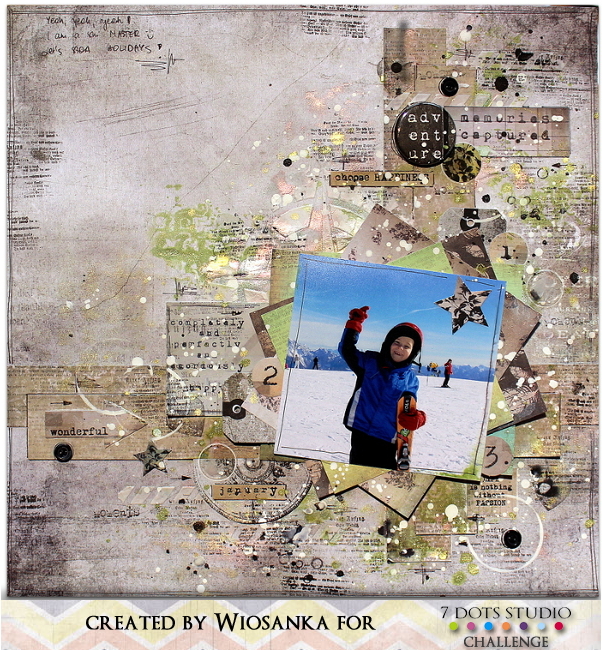 A sparkling door hanger reminds that a magical snowy season is welcome and awaited. We announce winners by the end of the January. One lucky person will win a 50 USD worth box with OUR NEW COLLECTIONS!! !